DigiBarn was featured on CBS Affiliate KPIX (San Francisco) program Evening Magazine (Nov 30, 2004). Digital dub of segment TBD. 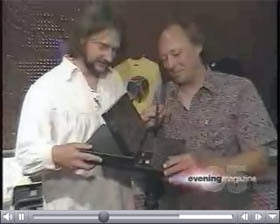 The show was taped in July of 2004, see our pictures of the taping here. Click on Play for DigiBarn on KPIX Evening Magazine (or view this piece larger on YouTube or at the DigiBarn Collection at Archive.org).